Why Create an Organizational Framework? An organizational framework is simply a way of thinking about an organization and its stakeholders that allows leaders to decide which elements warrant attention, development, and integration with other elements so there is an authentic, intentional, cohesive, and capable way of both running and developing the business and developing individuals in the process. Ideally, everyone approaches this deliberately such that the intersections of employees’ most desired growth areas intersect with high-impact areas for the business so that capacity is growing at multiple levels: people, teams, functions, and enterprise, and it’s a win-win partnership between individuals and the organization. 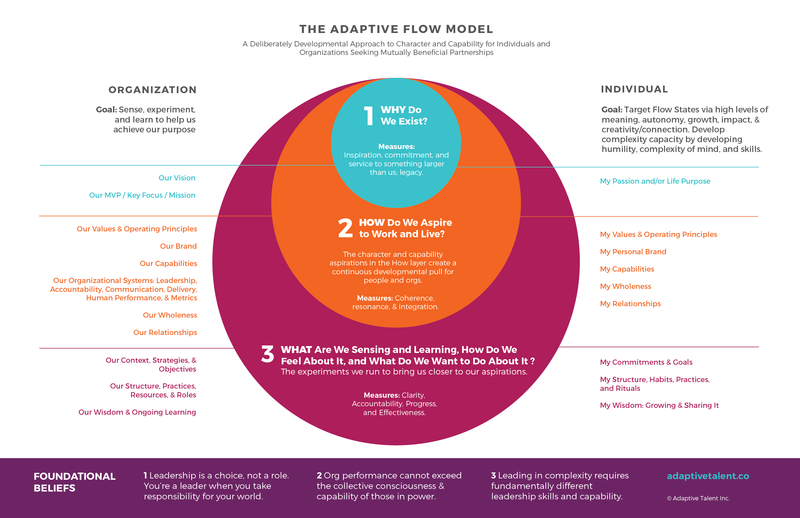 The Adaptive Flow model shown below is my attempt at identifying the elements I believe should be addressed with every organization and stakeholder to create win-win relationships and ongoing customer relevance and satisfaction. Our business is focused on individual and organizational adaptability by helping people thrive in complexity so you’ll see that we emphasize elements that help organizations sense, experiment, and learn (i.e., adapt) better than the competition. We believe an organization can do that when individuals (1) maximize meaning, autonomy, growth, impact, and contribution/creativity in their lives and (2) develop skills to navigate in complex environments and develop mental complexity greater than their environmental complexity (or else the leader’s capacity acts as a brake on results). Every organization should design a framework that works well for them; there is no one “right” organizational framework because people will view organizations differently, circumstances change, and/or they’ll choose to only focus on certain items. You’re using a framework properly when it makes collaboration clearer, more effective, and (hopefully) more enjoyable. If you are truly clear on your actual values and purpose, the framework can help you articulate an employee value proposition that repels the wrong people and immediately draws the right people to you. However, if you say one thing but do another, the use of a framework broadly shared amongst stakeholders will quickly identify your incongruities. You will need to be “all in” to be both aspirational, honest, transparent about your current “state”, and credible with your plans to close those gaps or people will become cynical fast. Because people are constantly changing, and our world is constantly evolving and becoming more unpredictable and complex, a framework provides stakeholders with a tool to update these aspirations and create a continuous developmental “pull” for the organization and employees. The gaps between the aspirations and current state are then used to create a prioritized organizational and talent development plan. A framework allows its authors to use design thinking to prioritize certain elements as foundational. I used Simon Sinek’s Golden Circle model as a base because I think it works equally well for organizations as it does individuals, and because many of the same elements that contribute to people’s happiness and success can be mapped to comparable organizational facets. The ideal adaptation strategy continuously reflects upon the desired character (or brand, in the case of an organization) as a tool for creativity and decision making. I believe this is one of the most important benefits of a framework; anyone can have a bunch of strategies and goals, but so often the context of why that’s important, and how it’s related to our desired identity and purpose is missing. Without clarifying these distinct elements, and intentionally linking them together, you can simply react to the world endlessly and/or work against yourself, versus creating and leading that aligns with your aspirational identity and desired legacy. There will never be a perfectly clear answer to this question of character; by its nature it’s reflective. For an organization, multiple elements can constitute “character”: the product or service itself; customer service; resource allocation; brand identity/promise; actual values as represented by consistent behaviour of individuals, particularly those with executive roles; and the design of the organizational structure, roles, and ways of working. You can substitute culture for character when thinking about an organization. The opportunity for leaders is to integrate these elements into a coherent whole first by defining them into actionable, measurable elements individually and secondly by showing how they’re inter-connected. My belief is that culture is the white space between these elements; it’s a result of the things you can control and repeated, rewarded ways of working that in turn shape beliefs. The art of culture at scale is cultivating awareness of these beliefs and choices at a company level and creating opt-in moments for each person to exhibit leadership and make choices in their world that in turn strengthen the culture. Unlike the why and how layers that are more long-term, the “what” layer is fully about the present. It’s every experiment we’re conducting in role and organizational design, practices and policies, and any strategies and objectives that aim to “close the gap”. For an individual, it can include growth in leadership and technical skills, and the enhancement of self and systems awareness (the complexity of mind) to handle greater ambiguity, nuance, and unpredictability. Whether we acknowledge it or not, every aspect of running a business and one’s life is an experiment that deserves a deliberate and frequent review of effectiveness and alignment with aspirational character and capability. Much like an agile sprint, I believe every team and person should regularly assess how their results compare to the original assumptions, limitations, conclusions, data points, and design goals reflected in their plans. One of life’s great joys is creatively engaging with life (versus being a victim and feeling life is “happening to you”), reflecting on results versus expectations, and experimenting with a different approach. Awareness: a wide and deep awareness of self, others, and context; this is as much about what you choose to pay attention to as it is about your blind spots. Pace: the ability to develop capabilities that are greater than or equal to the requirements or complexity of your environment. Development takes time and resources, and leaders who underestimate that put themselves at a disadvantage. Impact: the ability to accurately understand one’s impact on others. Adaptability: The ability and willingness to sense contextual changes and proactively evolve to achieve one’s aspirations. Don’t want to be the next Kodak? If you’re intrigued with a framework as a developmental tool, consider forming a small group to help you explore everyone’s perspectives on what is working and what needs to evolve inside your organization. Some people are very sensing / practical thinkers so starting from their reality will be helpful to then engage them in more reflective thinking about organizational design and development. Have the group select/create a framework along with every element the group agrees are relevant enough to define and allocate attention and resources towards. Decide which elements will get defined first, and then assign people to generate content and then facilitate subsequent discussions with the larger team. At the end of it people should be ready to commit to an overall organizational framework, elements, and definitions. Once the aspirations are clear the analysis of how the organization is currently doing on those elements happens. This can be a very fun, inclusive way of leveraging perspectives to create a tangible expression of “current state” and the implications for the team’s ability to achieve them. Transparency with this activity can be incredibly helpful with growing leadership skills and business acumen with your entire employee population, and there will be many opportunities to pull others into the task force to add input and/or explore potential experiments. The key to all of this is dialogue and the finding ways to help people make their thinking explicit to others. Open ended questions asked from a place of humility and genuine curiosity are incredibly important for this work. Choices and priorities naturally will need to be made that integrate clearly with the known deliverables of the business. Be prepared for some people to see this work as secondary or unrelated to the revenue generating activities. Ideally, people can approach both the known work of shipping product / offering the service as an experiment that can be reconciled against the proposed development to close the identified gaps. This will be important to ensure that those items that must be met or delivered will indeed get proper resources while still allowing the evolutionary work to happen within resource limits. In other words, you still need to fly the plane as you’re rebuilding it so make sure your team has shaped the plan, supports it, and feels it can be achieved. I strongly suggest allowing people to nominate activities to “stop” doing in order to create resources to address this developmental work. This entire process is an incredibly rich opportunity to develop leadership skills for your people. I recommend having 1:1s with every participant to reflect on the organization’s leadership model and how this experience might be a perfect opportunity to develop one core skill throughout the process. Check in on your relationship while you’re at it and run an experiment for the next few months to try and optimize mutual effectiveness, enjoyment, and development. I look forward to hearing from people about this idea, and how it can be improved, particularly the actual experience of following this process.